Automatic 8 linear station auto tool changer for increased productivity. PC base CNC controller is set up to accept standard G code programming formats along with on board conversational applications. User friendly IC Control System powerful closed positioning loop software with Ethernet interface for data transfer from PC. Optional CAD/CAM system can create and edit part programs then send to machine for cutting easily. DXF files can be imported, modified and edited from here to create a G code. DNC is no longer required as the PC directly stores all part programs in a text editable file. Machine designed ready for 3-D cutting usage and superior performance. Moving gantry construction for space saving. The rigid steel frame construction has been stress relieved prior to finish machining to provide repeat ability and accuracy. The HSD spindle uses CP4 DB bearings with a dust free design. The Heavy-duty fan cooling system forces air through the spindle to assist in trouble free operation. Automatic frequency brake for the spindle allows rapid deceleration resulting in faster tool changes. Linear guides and sliding blocks are prismatic pre-loaded with recirculation bearings to ensure maximum rapid traverse and precision. The X & Y axis are equipped with a precision rack & pinion driving system. The Z axis utilizes a ball screw assembly complete with the pre-loaded and ground screw for long life and optimum accuracy. 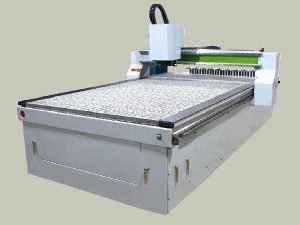 Special design 6 zone vacuum table surface for powerful hold down. Pneumatic slide dust hood and central lubrication to extend the life of the linear guide ways and highest accuracy. ”I” series machine comes with mobile pendant control panel for operator convenience.